Creating includes kitchen duty for Robertatalloni. Food explorations are a portion of this writer's article list. Whether you are easing into a low carb diet or jumping in full-fledged, ready to fly, this faux mac ‘n cheese recipe is a great addition to your new meal plan. 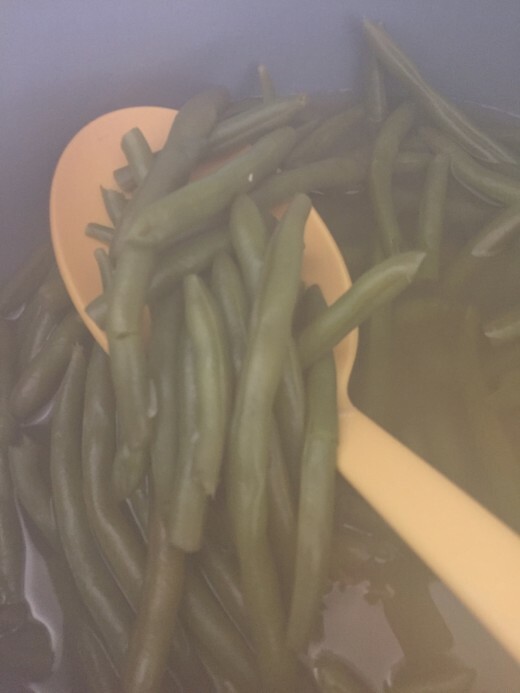 Easy to put together, there’s time to cook up a side of fresh green beans while it bakes. 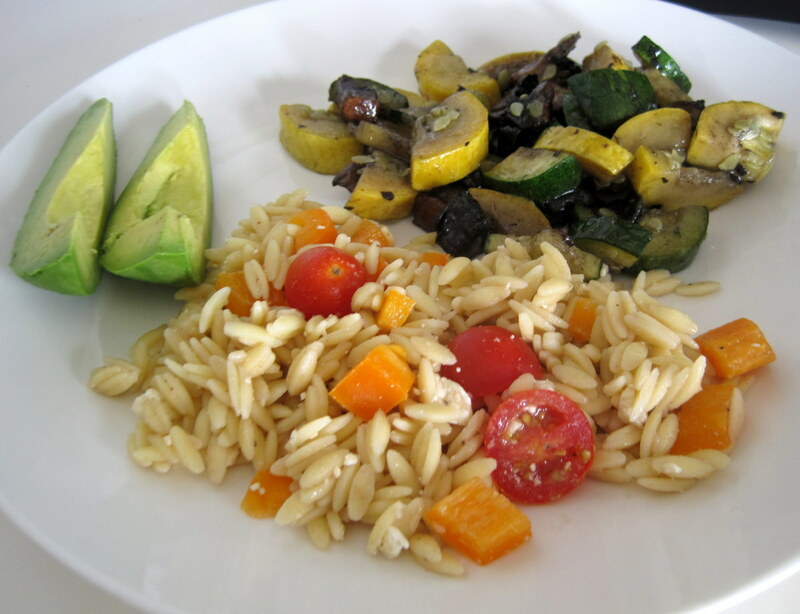 Voila, you have good food that is good for you. Once you taste this cauliflower recipe your estimation of a humble vegetable will take a jump even if you already like to eat it. Seasonings fill the kitchen with the aroma of yummy smoked/grilled foods, making it a special meal for guests to walk in on. 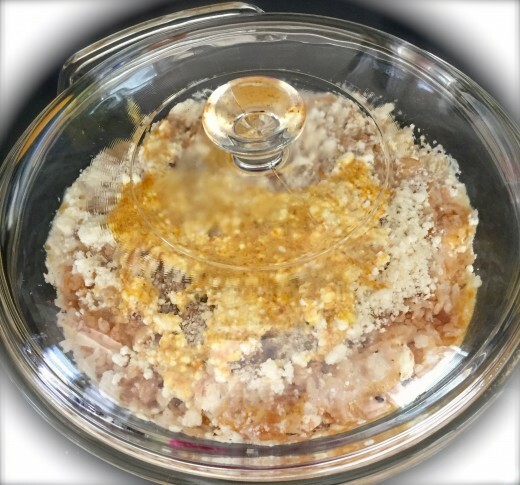 Keeping riced cauliflower and ground flax seed in my freezer as well as having the seasonings on hand made my experiment with these ingredients super fast. 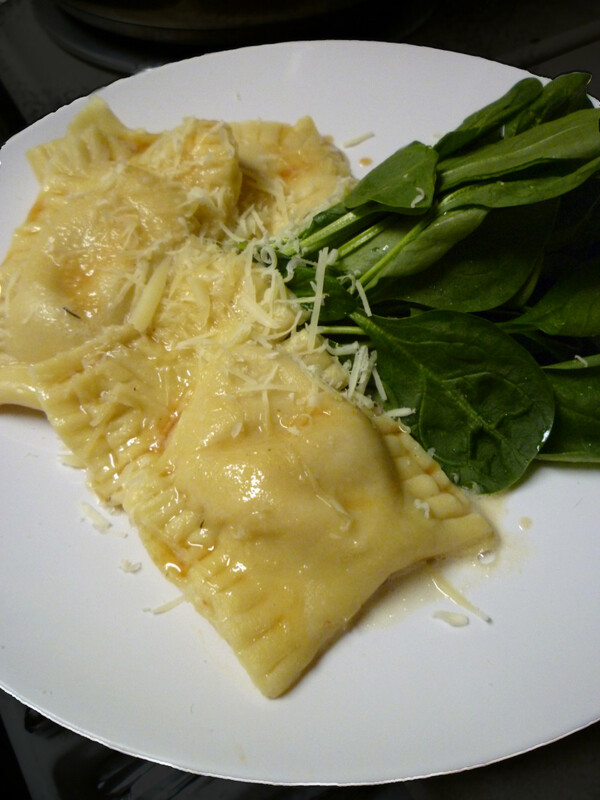 I avoid cow milk products, substituting goat’s milk products for them, but have found that I can once in while use the harder cheeses in recipes. Depending on how I’m feeling or who else I’m feeding I might use all goat’s milk cheese in this recipe to make it cow milk free at times. 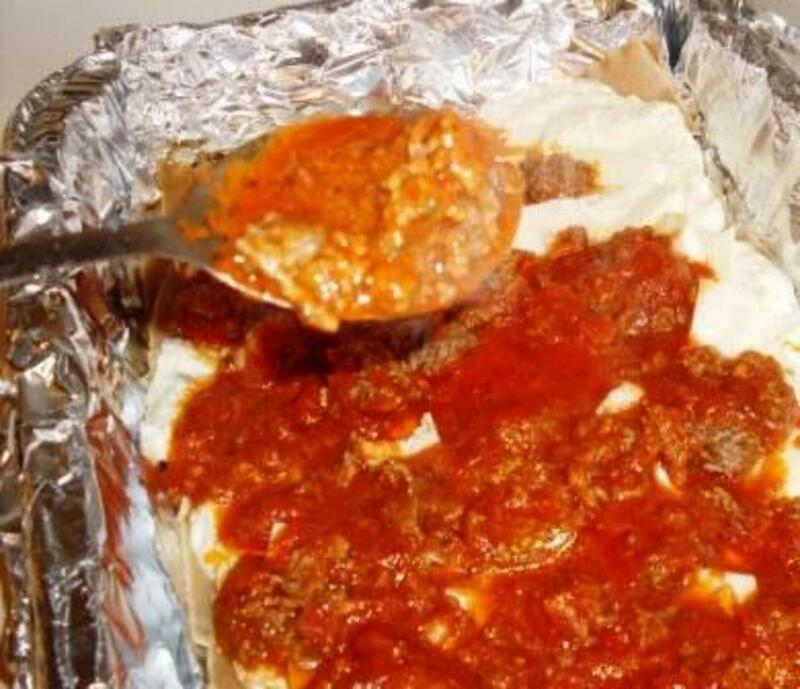 Prepare baking dish with cooking spray or coat with olive oil. Begin preheating oven to 400º. 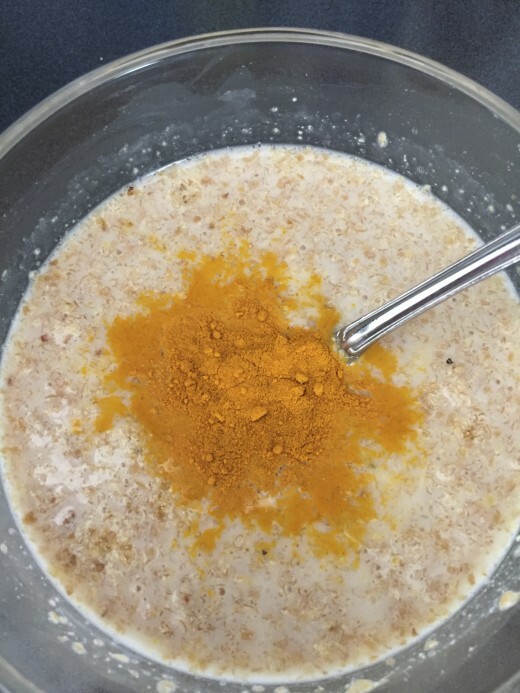 Mix egg in a small bowl with the almond milk (or bone broth), onion, salt, and turmeric, adding ground flax seed to soak and thicken while preparing the rest of the recipe, stirring mixture once or twice in the process. 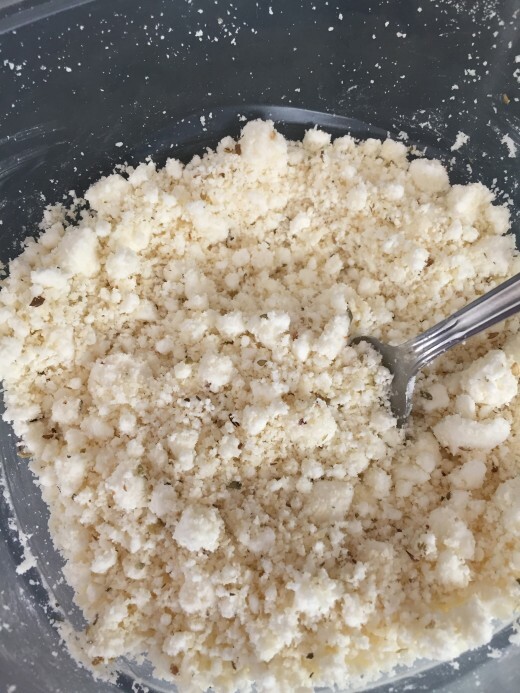 Using a fork stir the goat cheese, parmesan, oregano, and garlic into a separate small bowl to make a dry, crumbly mixture. 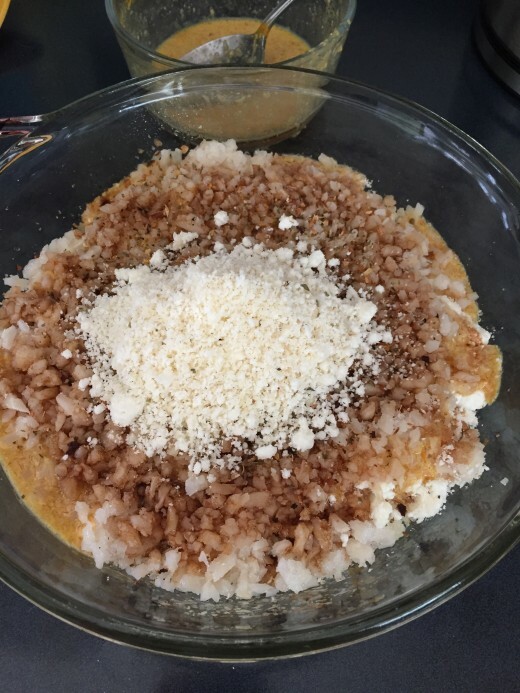 In the baking dish layer the flax mixture and the cheese mixture between riced cauliflower (each layer sprinkled with burger seasoning mix to your taste), reserving about 1/8 cup of each mixture for the topping. Sprinkle Colgin’s liquid smoke over the last layer to taste (we like about 1 generous tablespoon), finally adding the last of the cheese mixture, then the flax mixture with about 1/8 cup almond milk (or bone broth) mixed in to thin it. Cover dish and bake for 20 minutes. Uncover dish and bake for another 15 minutes, or until bubbly and browned to your liking. *Side note: If your various seasoning mixtures contain salt you may want to eliminate the 1/8 teaspoon salt from the ingredients list. After baking this up and enjoying the low-carb meal with my husband we decided that next time the almond milk could be replaced with bone broth. Obviously, meat proteins could be added for an even heartier and more flavorful dish. Sautéed mushrooms along with other veggies would add another substantial layer of yumminess to this casserole. As for more side dishes, coleslaw came to mind, as well as other salads. Roasted asparagus would be a favorite for us. The following list has some great no/low-carb bread recipes for any dieters who want to round out this meal. Many grain-free breads can be baked and frozen ahead of time for quicker meals but some of these are ready fast and yummiest fresh. • Super Fast 4 Ingredient Low-Carb Bread: Look out breakfast! • Easy Keto Bread: Learn Keto bread fast! • Nicely Textured Almond Flour Bread: Lovely homemade bread! 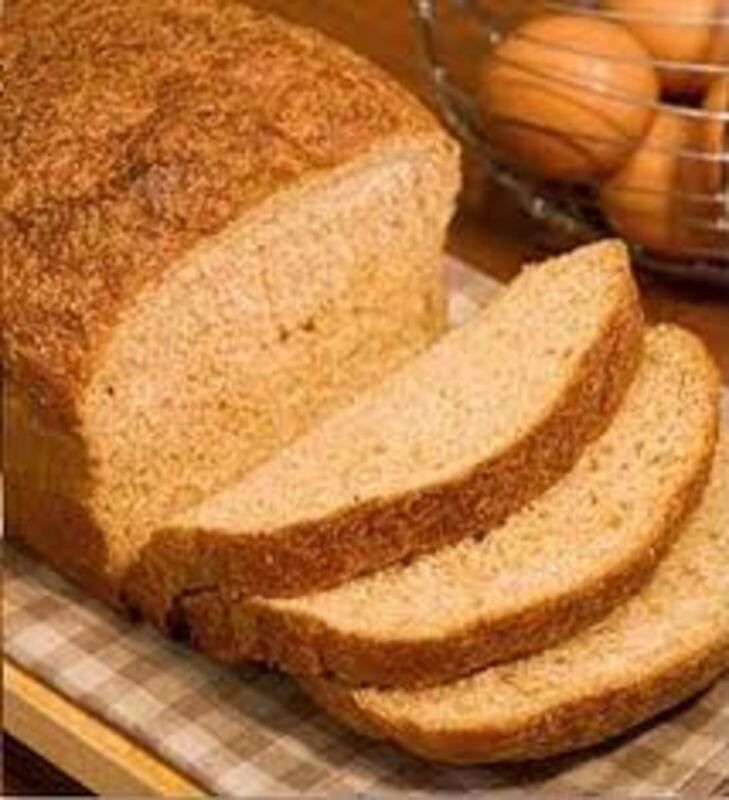 • Tasty Low-Carb Yeast Bread: Taste it up! My husband thinks it would be great with a pie crust, as in chicken pot pie and he also had a crunchy crouton topping in mind but those ides do not fit our new way of eating. As it is, he said the best thing he like about it was that there was a half dish of leftovers waiting on him. Other ways to ramp it up may come to you. Adding your ideas to comments below would greatly appreciated! 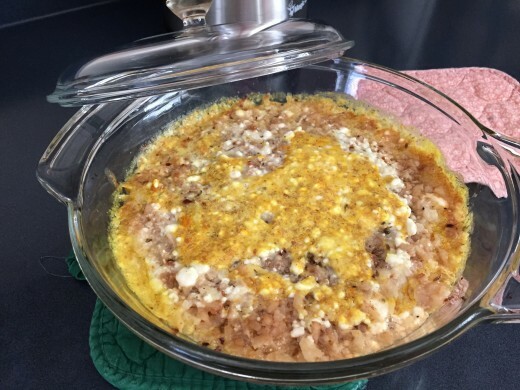 Thanks for checking out this cheesy low-carb, fake macaroni and cheese casserole. Is it difficult for you to believe that a recipe with cauliflower as a main ingredient tastes unlike cauliflower? Perhaps, but I am suspicious. Do you think this recipe could make cauliflower more appealing? You are welcome! Thanks much for your comment here. So glad to know it sounds good to you! I make mashed cauliflower often but this recipe will add a whole new level to it. The goat cheese and smoke flavor are two ingredients I never considered. Thanks so much for sharing this idea. This sounds amazingly delicious. I love all veggies & mac & cheese. Thanks for sharing this recipe. So glad to know you found this recipe useful. I do hope you find it satisfying and versatile. Though my husband like it as printed, I would limit the salt a little more for my taste. The good thing is he can always add more if he wants to. We've once again begun the diet we've used in the past that worked so well for us. This recipe will be useful and my husband asked today if we could have it again soon. We need to reduce the carbs and bad fat in our diet. My husband loves mac and cheese so I'm going to try this recipe. I hope he likes it. Thanks! I am going to pass this along to my father-in-law. He just read a book about plant lectins, and is all over trying to avoid grains. This sounds yummy too! Thanks much for checking this recipe out! Yes, I was hesitant for several reasons, the cooking smell for one thing, but maybe something about the riced smooths out the aroma. Anyway, do try this and other new cauliflower recipes and let us know how it goes. Aren't you near Vancouver? If so, there is a Costco just over the border in Bellingham. Our Costcos carry the frozen riced cauliflower, making recipes super fast. Thanks for coming by! Thanks so much for letting me know it sounds appealing. My husband loved it as is and wants to have it again soon, but I would definitely leave out the extra salt because some of my seasoning mixes contained a good bit even though the labels indicated not much. I do plan to try the recipe. I started Keto to reduc inflammation in my body (particularly for arthritis), and it has helped. In the past 6 weeks my fingers don't hurt all the time and my back has improved. Plus, I have lost 10 lbs., and am very close to my goal weight. I do plan to try this recipe, and I will let you know the results. Hi Mary, thanks for stopping by. Riced cauliflower has become very popular as a replacement for rice and pasta. It's about appearance/texture, but it works nicely for those wanting to avoid the carbs yet have a rice/pasta styled base in a recipe. 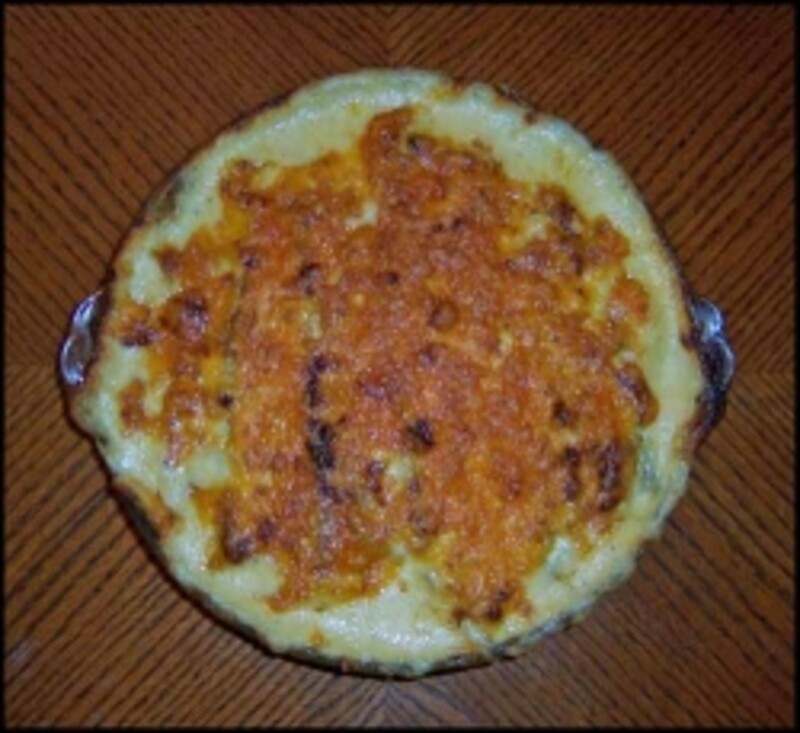 The recipe above is just a play on words from the old stand-by casserole called macaroni and cheese. There are even riced cauliflower pizza crust recipes now, which as Peggy mentioned, are delish. So appreciate that you've checked this recipe out and thanks too for adding the info on the cauliflower pizza crust. I've been meaning to try one of the recipes. Have you thought to share yours on HP? Thinks for the recipe. Looks healthy. Thanks also for the options you suggested. Hi! Thanks for being first to reply. :) Would be very interested in reading about your results with KETO eating. Yes, coconut milk would work, but I would probably prefer the bone broth. My husband was very interested in the leftovers last night. If you tweak the recipe to your tastes I would love to hear about the results. Thank you for sharing this recipe. It sounds very tasty. I've heard about using cauliflower as a substitute for rice or another grain before. Your recipe has encouraged me to try it. Thanks for sharing this simply wonderful recipe. I love cauliflower and often use rice cauliflower in recipes. I'm really looking forward to your recipe. We eat cauliflower and cheese whenever I find a nice looking head in the store. I'm a little confused about ricing the cauliflower, what is the reasoning behind that? I am not on a low carb diet but we don't normally put pasta with the cauliflower cheese in any case. With all the cheeses and other ingredients you added to the riced cauliflower, I am sure that this would be delicious. So far I have only used the riced cauliflower in making a pizza crust. It was amazing! Thanks for your recipe. I think this recipe is perfect for me as I have been following a KETO diet for the past 5-6 weeks to reduce inflammation in my body. I a(I'm ssume you are talkin about chicken bone broth, not beef. Also, instead of almond milk (I'm allergic) I would assue coconut milk would work. 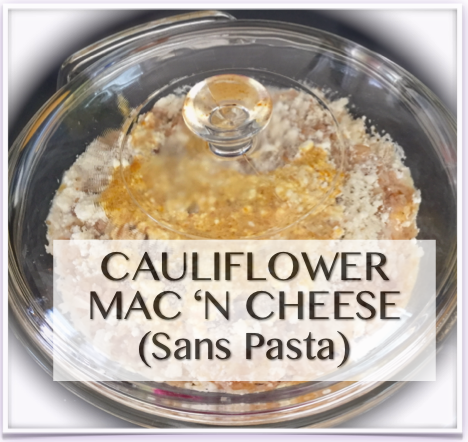 We like califlower and I think this recipe would be great for us. You husband sounds very creative in his thoughts for various cooking ideas. 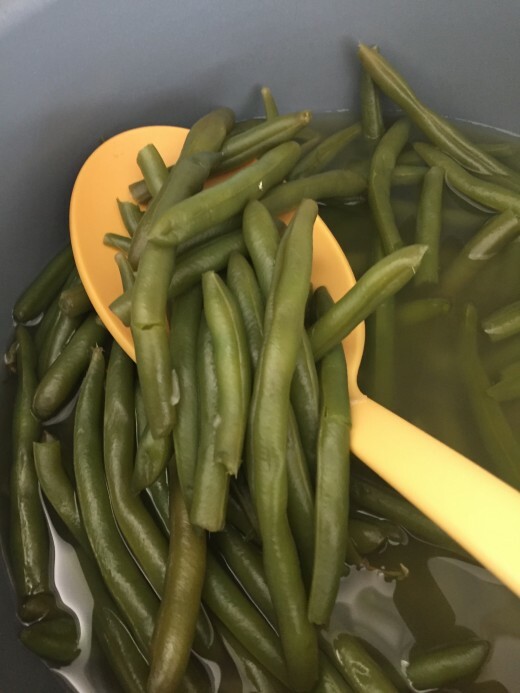 Thanks for sharing this good recipe!